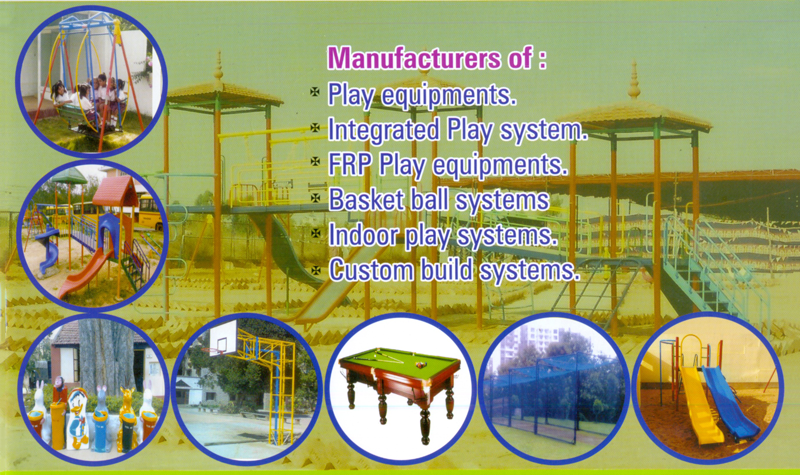 We are an industry specialized in manufacturing Children Playground Equipments for the past 17 years, in the process have required a reputation for quality products. We are able to provide these quality equipments at affordable prices. We have over 560 installations in Bangalore City and also covering 50 Public Playgrounds, 190 Schools and Institutions, 119 Apartments and Housing. We have also installations in Building Projects, resorts, Hotels and Clubs. We have also supply Children Playground Equipments like Basket Ball Post, Garden Benches Wooden & Metal Cement Benches, Table Tennis, Billiards Tables, School Desks & Benches, Fiber Glass Dustbins etc., and also Imported Playground Equipments. Our equipments have been specifically designed for Resorts and Parks to accommodate Children play near Gardens, Parks etc., and these equipments are available in various Designs, Size and finishes to reasonable rates. Site restriction, age group and weather conditions. We hereby are enclosing our catalogue, price list and Commercial Terms for your kind perusal.